How Sweet It Is: We're going back, back, back to school again! We're going back, back, back to school again! I love that song from the movie Grease 2! And we were in full swing on Monday for the first day of school. Josh woke up super early since he goes in earlier than the rest of the clan. He was ready to go with his breakfast made and everything. I tell you, that kid is just on top of things. Aaron woke up and headed downstairs and requested eggs for breakfast. Ellison was still showering since she goes into school last. Sergio got to drop off Aaron for his first day of school. He got a great teacher for 2nd grade, Ms. Bass. So at 7:15 a.m. off we went. First stop, Josh's middle school. Already the line was enormous. We made a note to come drop off earlier to avoid the lines! Then I was dropped off at work and Sergio took Aaron to school. Ellison rides the bus to school. I can't believe she is now a Senior! Pretty soon....college. Where has the time gone?? After school everyone reported a great first day. 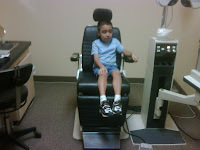 The second day of school Aaron got his eyes checked. He has had some trouble reading so I thought I'd take him to a specialist. It turns out that those glasses are ok. He is farsighted and needs his glasses to read. While there, Aaron entertained the staff with his stories and told his doctor after seeing his retinal scan on the computer, that he knew exactly what was wrong with him and he had just diagnosed himself. The Dr. got a kick out of that. Then the Dr. asked Aaron what his favorite thing about school was and Aaron answered, after a little pondering, "dismissal". The Doctor cracked up. Then she asked what his least favorite thing was and he quickly said "music". Then he added "I am a science kind of guy". The doctor was pleased with his answer. The whole staff remembers the tiny little boy with the big personality. 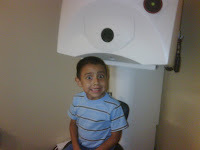 Waiting to get his eyes scanned with this super cool camera. We could later see the inside of Aaron's eyes on the doctor's computer screen. Aaron loved that. LOL Aaron, I think that is great. I love dismissal too and many times it is my favorite thing about school. I am so glad the kids had a great back to school day. I too can not believe Ellison is a senior. Enjoy this year, it is over before you know it. I am really glad that you, Patty, my dear are feeling so much better. You looked great today!